In a saucepan, melt butter over low heat. Stir in flour whisking until smooth. Add milk, salt and pepper. Bring to a boil; cook and whisk 2 minutes or until thickened. Remove from heat; stir in cheese in small amounts stirring between each until melted. Add the potatoes and onion. Transfer to a greased 9 x 13 baking dish. Cover with foil and bake 1 hour. 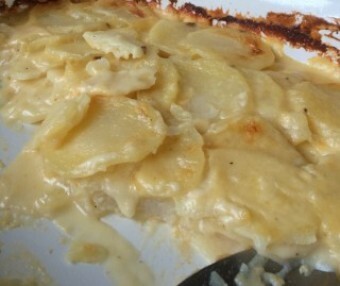 Uncover; bake 30-40 minutes or until the potatoes are tender. Yield: 6-8 servings. You can use a smaller dish, but the larger dish makes the potatoes a thinner amount so they cook completely. Russets are your best best for that creamy potato. You can add chunks of Ham to make for a full dinner.